rec. live, 24-25 May 2005, Tonhalle, Düsseldorf. Germany. Looking over the track-listing for this release, and one can be forgiven for wondering what on earth is going on. Basically, Demofoonte is the thirteenth of 27 major opera dramas by Metastasio (1698-1782).The libretto is one that is among the most frequently set to music ever. By the year 1800 it had inspired at least 73 operas by, amongst others, Vivaldi, Gluck, Paisiello, and Galuppi. Wolfgang Amadeus Mozart was a composer who used Metastasio’s work more than that of any other poet, so it is no surprise that he would have been interested in this libretto. While he never completed his version, Mozart certainly made at least two attempts to work on the project, mentioning progress in letters to his sister. The resulting release consists of the six arias which Mozart completed. These usefully sum up the key moments of the plot, and German author Sabine Radermacher has created a number of spoken text passages based on Metastasio’s original drama in order to fill in the missing story lines. The whole piece has then been bulked out with instrumental compositions by Mozart from between 1769 and 1778, which provide sufficient scenarios and material to complete a satisfactory ‘night at the opera’. The work opens with Mozart’s Symphony in G K 74 from 1770, although it should be noted that the authentication of the work has been questioned. Written during Mozart’s first trip to Italy, the work has a suitably overture-like character, similar to that of an Italian sinfonia, and with suitably simple orchestration. Further selections include the “cassation” music K63 and 99. Four pieces from the ballet/pantomime Les Petits Riens K299b form the conclusion. This was written in 1778 in Paris, and is all that remains of another failed project, the composition of the opera Alexandre et Roxane. These movements provide a light and playful conclusion after all of the preceding heavy drama. The whole work concludes with a real party piece, the Gavotte in F.
The spoken texts are given in mildly gruff but expressive German by actor Matthias Habich, who has the role of the protagonist Demofoonte. I suspect most non-native speakers will zap past the spoken passages. Dodgy translations of these texts are given in the booklet, alongside the sung libretti and plenty of synopsis information. The story is a complicated one, involving impending sacrifices, enigmatic statements from omniscient Gods, secret marriages discovery, disaster and last minute reprieve. The pioneering Cappella Coloniensis lead by conductor Bruno Weil play with all of the early music verve one might anticipate, and the WDR co-production has lead to a very good SACD recording. Soloists are Eleonore Marguerre, Sunhae Im and Netta Or, all of whom are given remarkably demanding coloratura arias, or in any case arias with considerable range. Netta Or is an almost stereotypical wobbly soprano as Creusa in Non curo l’affetto, but the demands of the music make any alternative almost impossible. Eleanore Maguerre has a straighter vibrato, being allowed a more lyrical part as Timante. I don’t quite understand the male role of Timante being given a soprano voice, but no explanation of this is given so I shall have to let that pass. Marguerre has one of the highlights of the whole production, in the dramatic Misero me – Misero pargoletto, when all seems darkest and all hope seems lost. Sunhae Im has the most directly impressive singing voice, opening proceedings with In te spero, o sposo amato with noble purity of tone. H.C Robbins Landon points out how Mozart may have identified with prince Timate in this aria, seeing the secret marriage with Dircea as comparable with Mozart’s relationship with Constanze. Im also expresses a nice amount of ‘schmerz’ in Se tutti i mali miei. The live performance has a sizeable chunk of applause at the end, but audience noise during the recording is notable by its absence. So, what is the end result? The ultimate effect is a kind of ‘Readers Digest’ condensed Mozart opera, with no choruses or ensemble singing. The arias which we do have are, if perhaps not Mozart’s best ever, are certainly of a quality to suggest that his intentions were nothing less than 100% serious, though the plan to create an entire opera is never explicitly suggested in Mozart’s correspondence. The additional music has been well chosen, and will seem perfectly natural if you don’t know it too well already. The arias here were of course known before this recording, but this is a fine way of ‘rescuing’ a great deal of such fine music and bringing it beyond the bounds of academic or purely concert performance; that of a few surviving ‘fragments’ in isolation. 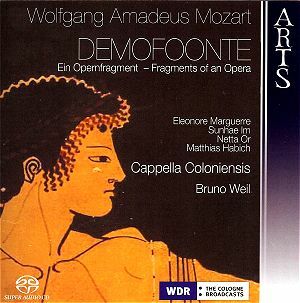 The booklet notes point out that there is a deal more substance in the 50 minutes or so of original music for Demofoonte than in most of Mozart’s other ‘official’ opera or stage production fragments. What is nice about having the extra pieces is, to my mind, that the pacing of the drama is left over to the imagination. If one can imagine the piece as a combined opera/ballet entertainment then there is much to be said for such a solution. After this production I am sure that others will come up with other ideas, but for the time being I’m glad to have this as a new Mozart ‘discovery’.